…is finally here. Real Betis Balompié return to top class European action tonight. Standing in the way of a victory is Remí Garde’s Olympique Lyonnais. The squad is on a real high after out-classing Valencia at the weekend with a runaway 3-1 victory. The team tonight is likely to be much changed as Pepe Mel tries to keep things fresh. Betis bought heavily during the summer for that reason, enabling the team to battle on more than just one front. Many have cited that tonight might be a ‘reserve’ team. Far from it. Nosa should start and Verdú is likely to return as well as Damien Perquis, both after injury lay offs. Expected to provide the defence on the flanks are Steinhofer and Dídac. Rubén Castro is likely to be lying in wait on the bench. Béticos need not fear a dismal effort on the Europa League front. The club have worked so hard to get here, they are not going to through it all away and be out of the competition as soon as they can. In his press conference Mel said, “Our aspirations in the Europa League are the maximum”. It’s just that Mel doesn’t want the league form to suffer, which is highly understandable. Therefore, players who played at the weekend are likely to be rested and vice versa next time. 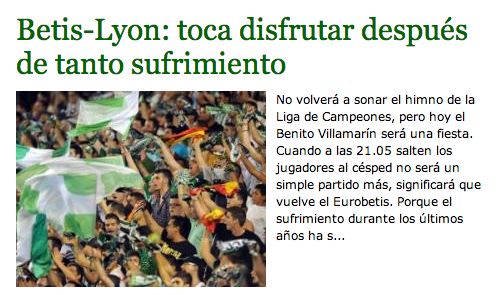 I really like AFDLP’s headline – toca disfrutar después de tanto sufrimiento – Enjoy after so much suffering. There is not much else to say apart from that it all gets under at precisely 20:05 GMT in el Benito Villamarín. ← Salva Sevilla and co. vanquish Valencia! Enter your email address to follow BlogBetis and receive notifications of new posts by email.